Polar explorer m/v Ortelius could be called, “The Little Ship that Could.” Certainly, it was hats off to the ship, captain and crew when a tricky Antarctic mission met with success on my November, 2017 sail. 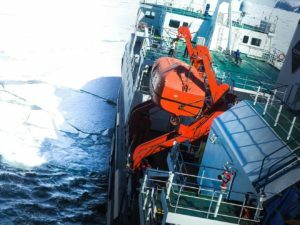 Passengers were treated to a rare Antarctic sight thanks to savvy navigation and Ortelius’ ice-strengthened hull. Two onboard helicopters did their part as well. And though Ortelius is a hero of a ship, she’s not a princess. Passengers looking for a polar expedition featuring cruise ship-style amenities won’t find them here. The magic wand of design has not graced this ship, and although crew are friendly and helpful, they won’t be delivering champagne and hors-d’oeuvres to your cabin at 5 p.m.
Ortelius is one of three polar explorers owned by Dutch company, OceanWide Expeditions, which only sails the Arctic and Antarctic. A fourth new-build ship launches in 2019. 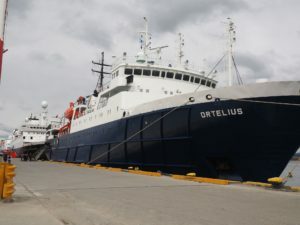 Ortelius was refurbished by Oceanwide following its purchase from Russia in 2011. The ship had been a research vessel. Its Arctic voyages include mild activity such as shore walking and whale watching. Or you could choose a high adventure voyage such as polar bear spotting or ski mountaineering. 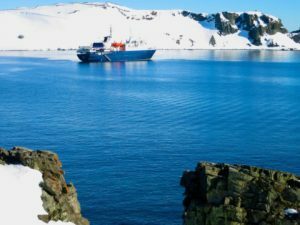 On the other end of the earth, Antarctica voyages include multiple shore visits via Zodiacs (motorized rubber rafts) to penguin colonies and historic sites. Those opting for high octane thrills can choose a voyage with the chilly challenge of overnight camping. 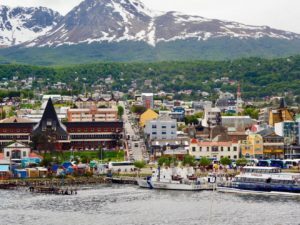 As we waited to embark colorful in Ushuaia, Argentina, excitement buzzed among passengers on Ortelius’ deck. We chatted about this trip’s mission: an attempt to reach Antarctica’s only accessible emperor penguin colony. 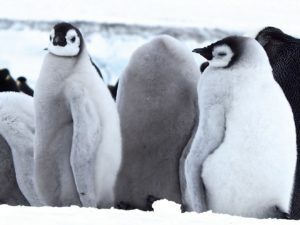 All other emperor penguin colonies are located in frigidly daunting locations south of the Antarctic Circle. On our journey Ortelius would sail further south than expedition ships typically go. Dipping just below the Antarctic Peninsula, we hoped to sail into the Weddell Sea and cross it to reach Snow Hill Island where the emperor colony lives. But the Weddell Sea freezes in winter; now it was early spring. Had ice broken up enough to allow passage? I doubt many passengers understood the long odds of reaching the penguin colony. My husband and I were certainly clueless. We’d nabbed a last-minute discounted booking and were too busy packing to research the journey. We were unaware that attempts to reach the colony had failed since 2013. And we did not realize that in 2011 a mighty icebreaker ship got trapped by ice while trying to reach the penguins on Snow Hill Island. Given its Dutch home base, Ortelius draws passengers from a host of countries, including 18 nations on my trip. There were documentary filmmakers on board, hoping to snag rare penguin footage. Professional photographers, avid birders, outdoor adventurers and everyday people were among us. A surprising number were in their 20s and 30s. 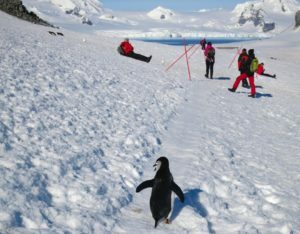 Antarctica sailings typically skew heavily to retired and middle-aged passengers. Most passengers and all of the crew spoke English, the official language on board. The expedition team, headed by a Canadian biologist, was an international mix with varied levels of experience. But when it came time to wrangle, this team got the job done. What the expedition team had in common was passion for Antarctica, and that was expressed both in person and in lectures on whales, sea ice, sea birds and penguins. What the expedition team did not have in common was matching parkas emblazoned with the company name. You see that on many expedition cruises. Parka self-sufficiency is assumed for passengers as well; there will be no bright parka shipped to your home or waiting for you on board as a pre-departure gift. Pampering is just not Ortelius’ style. Personally, I enjoyed figuring out things myself, and that included hunting down my warm waterproof, reasonably priced Craghoppers parka. I also enjoyed the informal atmosphere on Ortelius. It was easier to be yourself and befriend others. And there was more latitude to make it your own voyage. 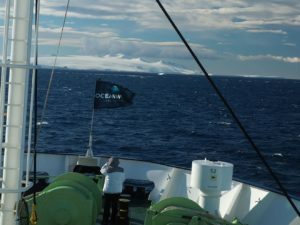 Sailing the Drake Passage, numerous passengers retreated green-faced into cabins. 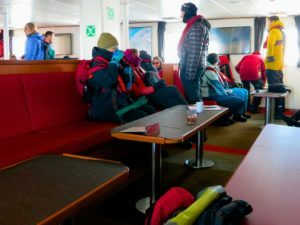 The rest of us discovered the ship’s physical limits—no place to exercise, and the only public gathering place is a bar/lounge with red-padded benches. There is a lecture hall, but church-like benches discouraged casual gathering. The bartender was adept and the dining room served up one pleasing meal after another, including well-received vegetarian options. Ortelius’ cabins, like cabins on many expedition ships, feature berths attached to walls for greater safety in rolling seas. Ortelius also has a few cabins with double beds. The berths are surprisingly comfortable, and my husband and I found plentiful storage space in the cabin, which also has a roomy desk for stashing photo equipment and laptop. Beyond comfort, though, the colorless cabin was not the best hangout. The rough-`n’-ready style of many expedition ships can surprise travelers accustomed to cruise ships. Décor, or lack thereof, is designed to deal with muddy boots, dripping parkas and stomachs objecting to rough seas. Cruise ship amenities can be found on high-end expedition ships, such as those operated by Silversea and Seabourn. Ortelius’ deck space is generous. As we sailed the Drake Passage, bird watchers gripping binoculars were enthralled by swooping petrels and albatross, including the Great Albatross with its 12-foot wing span. There was no visible land, just sheet metal sky holding resolute above gray wavelets smacking one another with teen fury. Doldrums dissipated as we reached Antarctica and snowy mountains followed by snowy plains— and those images went on and on — an unfolding tableau of immensity and isolation. As we sailed into the ice-chunked Weddell Sea, a minefield of potentially treacherous ice, we felt like explorers. At this point our isolation from the world was significant. 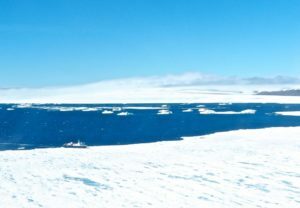 We were a two-day sail from the nearest ship or Antarctic station. As we hit the sixth day spent cooped up onboard, younger passengers lifted spirits. When it snowed, they sculpted seals on the deck. When the sea grew rocky they launched a hall-running contest — buy a round if you hit the wall. Runners were defeated by walls until a young Czech mother of two danced down without a touch. Up on the bridge our Dutch captain was “reading” a path through the Weddell Sea, judging which ice was dangerous, and which Ortelius with its ice-strengthened hull could navigate. Then we were anchored at Snow Hill Island. Our onboard helicopters flew us over seven miles of sea ice to base camp set up behind an iceberg so as not to disturb the colony of 7,000 emperor penguins. 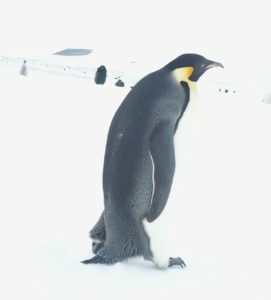 It was a day of penguin glory. We chuckled over antics of fuzzy six-month old chicks. Some batted fuzzy wings at another, falling over with the effort. Others waddled comically in imitation of a strutting three-foot tall parent. We watched and photographed in small groups of 25 in a position 15 meters behind a red rope, in accordance with environmental regulations set by International Association of Antarctic Tour Operators. Antarctic weather held steady, allowing helicopters to fly us on a second visit to the emperor colony that afternoon. 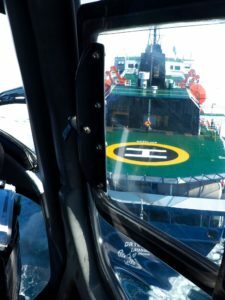 Ortelius’ helicopters are a necessity for flying over miles of dangerously crevassed sea ice. 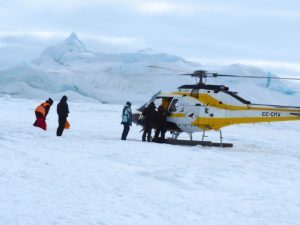 Very few expedition ships have a heliport and helicopters. Ortelius uses them on voyages involving deeper Antarctic exploration. Following our triumphant penguin mission, I dubbed Ortelius “The Little Ship that Could.” And Ortelius continued to deliver, though Antarctica gets credit for the big blue bowl of sky over Half Moon Island. We hopped Zodiacs to shore for another playdate with penguins, this time little scurrying chinstraps. As m/v Ortelius headed back toward the Drake Passage, the ship’s doctor applied anti-nausea patches behind ears that weren’t already wearing them. We were heading into a sizeable sea storm. 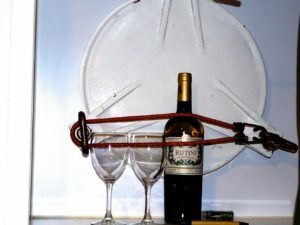 Many times that night waves smacked the ship so hard, I was tossed to the bottom of the bed. It sounded like a bomb had exploded. Could Ortelius survive this? It turned out we had been through a hurricane pummeling the ship with 50-foot waves. But we made it back to Ushuaia, and kudos for that to the Little Ship that Could.